The International Rice Research Institute (IRRI) joins its host country, the Philippines, in celebrating the 13th National Biotechnology Week from 20-24 November 2017. Back-to-back exhibits at the Department of Agriculture and at the Fisher Mall in Quezon City kicked off the week-long celebrations that highlight the role of biotechnology in improving the lives of Filipino farmers and consumers. IRRI’s exhibit booth at the Fisher Mall is one of the crowd’s favorites with its live plant displays featuring climate-smart rice varieties. Together with its partners—Biotechnology Coalition of the Philippines (BCP), SEARCA Biotech Information Center, CropLife Asia, UP League of Agribiotechnology Students, and UP GRAINS—IRRI organized an exclusive screening of Food Evolution, a film about genetically modified organisms (GMOs) and its food products, its contribution to food security, and how misinformation affect public perception despite the scientifically documented safety and benefits. Held at the UPLB DL Umali Auditorium on 21 November, the screening included a Q&A session with scientists. 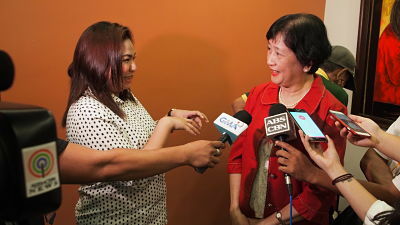 Dr. Inez Slamet Loedin, senior scientist and head of the Genetic Transformation Laboratory at IRRI, was a speaker at the Seminar on Plant Science Innovations and Sustainable Agriculture held on 22 November at the Agricultural Training Institute in Quezon City. This seminar provided insights on how the future growth of sustainable agriculture will be driven by science and technology — which will require continuous investment in breeding, biotechnology, crop protection and data science-driven precision agri-tools from all stakeholders concerned. Dr. Slamet-Loedin talked about the use of CRISPR-Cas9 in crop gene technology. A media seminar was likewise held on 23 November at Ka Tunying’s Café in Timog Avenue, Quezon City. 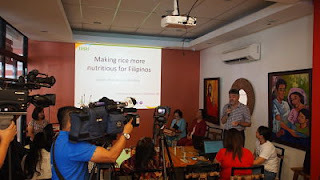 The seminar was co-organized with BCP and the Philippine Rice Research Institute (PhiRice). It aimed to create a better understanding among media stakeholders of the development and safety of food derived from modern biotechnology. The lectures were delivered by Dr. Saturnina C. Halos, Biotech and Climate Change Consultant, Department of Agriculture and Research Director of the BCP; Dr. Nina G. Gloriani, Professor, Department of Medical Microbiology, College of Public Health, University of the Philippines Manila and President, Biotechnology Coalition of the Philippines; and Dr. Russell Reinke, Healthier Rice Program Lead at IRRI. The National Biotechnology Week is an annual milestone celebrated every last week of November, pursuant to Presidential Proclamation No. 1414 dated November 9, 2007 . It highlights the technological advancements and potential benefits of biotechnology in agriculture, environment, and health for the country.